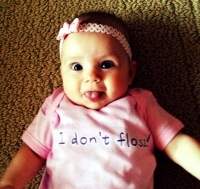 Cute infant/toddler tee shirt. This is for the color shirt you select in the options. You can choose any size from 6 months, 12 months, 18 months, 2T, 3T or 4T. If you need a larger size, please see our "Youth" option. This product was added to our catalog on 08/16/2013.